Alright ladies and gentlemen the time finally came for me to do my Rain Man like search for finding the best pressure washers available under the $400 range. This price range captures the majority of the most popular gas and electric powered pressure washers, if you're looking for commercial products look elsewhere. In this buying guide I'll let you know exactly what I learned about each washer from reading the positive and negative customer reviews on Lowes , Home Depot, Amazon , & Harbor Freight websites. Also I included my personal money & stress saving advice that you won't find anywhere else! DISCLAIMER:I have to warn you, it's impossible to find a well reviewed pressure washer without reading at least a few disturbing customer experiences. Essentially we are in the same boat, every power washer below scored very high on average, but every one had skeletons in their closet as well. I did the best I could in finding your best bets out there by eliminating model numbers that were complete nightmares, but ultimately you'll have to pull the trigger on the washer you like the most and hope for the best just like I will. Why Buy A Pressure Washer? Of course there's tons of uses and excuses for getting a pressure washer, such as power washing the stains from your driveway, sidewalk, and lawn furniture. You can also get attachments to clean your gutters, and blast your car with soap suds using a foam canon, which is the reason I decided to do this research in the 1st place. It all started the day I watched Auto Fanatic detail his Shelby GT350 Mustang. But of course I told my wife that I need it for washing the aluminum siding where carpenter bees apparently pooped all over my siding. (Yes, carpenter bees are disgusting!). 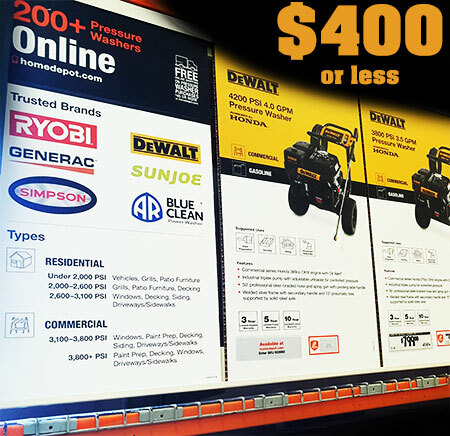 So if your house water pressure is good, but not good enough to blast away grime, mildew, mold, and brake dust, you came to the right website to find your ideal pressure washer. ENJOY! Also besides the 12 pressure washers that were reviewed, make sure to read the following 2 sections if you never owned one before, these 2 tips can save you a lot of money and stress. 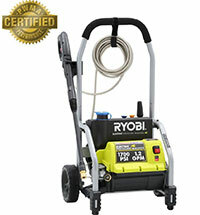 Ryobi RY1422 700 PSI 1.2 GPM Electric Pressure Washer comes with a turbo nozzle and an on-board tank for extra detergent. I really like this particular Ryobi electric pressure washer because it has a 25-foot non-marring high pressure rubber hose and three separate nozzles that are all designed for cleaning different surfaces like concrete, vinyl siding, and the exterior of vehicles. The hose is adjustable and comes with a trigger handle. The nozzles are easy to attach and twist onto the end of the hose. This pressure washer, priced at $149.00, has mostly five-star ratings on The Home Depot's website. People who have reviewed it say that it has a powerful spray and is also easy to use on some of the toughest surfaces to clean. The lower one and two-star ratings mention concerns like oil leaking out of the motor or the nozzles not working. However, they could be attributed to human error and people simply not knowing how to work the pressure washer. The Home Depot gives some suggestions for how the pressure washer can be used. It indicates that the pressure washer is ideal for cleaning brick masonry, the outside of an RV, fencing, and the surface of a patio. It is easy to carry around and relatively lightweight at 32 pounds. It is performance tested and rated in accordance with PWMA Standard PW 101. It also comes with a three-year warranty against manufacturing defects. Ryobi RY141900 2000 PSI 1.2 GPM Electric Power Washer comes with a turbo nozzle with 50 percent cleaning power. With a 13 amp motor, 35-foot cord, and 25-foot non-marring adjustable rubber hose, it is performance tested and rated in accordance with PWMA Standard PW 101. It also has a detergent tank and three separate nozzles designed to clean a variety of surfaces from concrete driveways to vinyl siding and fencing. This particular Ryobi pressure washer is priced at $199. It has its own rugged roll cage frame that protects the motor and keeps the pressure washer upright while it is being used. It also has a hose reel that allows for easy storage and carrying. Most of the people who have reviewed the Ryobi 2000 PSI 1.2 GPM electric power washer give it four and five-star ratings with a majority being five-star. I like that the people who have used and tested the pressure washer say that it is easy to put together quickly. I also like that they say it is easy to handle even though it gives off a powerful spray of water. However, it does have a few lower one and two-star ratings. The people who left these comments say that the trigger handle is hard to push in and that the long cord leading to the electric motor gets tangled up easily. These comments reflect more human error than anything wrong with the actual pressure washer. My Pick Ryobi RY802800 2800-PSI 2.3 GPM Honda Powered Gas Pressure Washer comes with a power control gauge that lets you easily adjust the pressure while you are using it. I like that this particular Ryobi gas pressure washer has a 4-cycle vertical engine. I also like that it has a .25-gallon tank so you can use it for at least 30 minutes without having to refill it with fuel, however a lot of people complained that the gas tank is too small for them. The RY802800 pressure washer was performance tested and rated in accordance with PWMA and PW 101 standards. It has a 25 foot rubber hose and comes with four adjustable nozzles designed to clean concrete, brick masonry, gutters, siding, fencing, lawn equipment, boats and RVs, and much more. It comes with a three-year warranty through Ryobi and another two-year warranty on the Honda motor. Also Home Depot offers an additional 3 year warranty for $60. 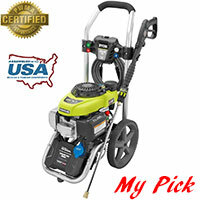 A majority of the reviews for this 2800-PSI Ryobi gas-powered pressure washer are in the five-star range. The people who gave it four and five-star ratings say that it is easy to start and also safe to use on surfaces like car exteriors and vinyl siding that normally need careful handling when cleaning. Ryobi RY80940B 3100 PSI 2.5 GPM Honda Gas Pressure Washer with Idle Down is designed to be economical and environmentally friendly. Its idle down feature saves on gas and gives you longer high-powered cleaning without having to refill the fuel tank. Priced at just under $400 at $399, this particular Ryobi gas pressure washer comes with a 25-foot power flex hose and a five-in-one nozzle for easy spray pattern changes. The hose also flexes like a rope so you can clean difficult to reach places like the corner of a patio or inside of an RV. It also is gentle enough to use on the exterior of a car as well as vinyl siding and fencing. The pressure washer is performance tested and rated in accordance with PWMA standards. It also has a roll cage that protects the motor as well as a coil for the hose that allows for easy storage and carrying. 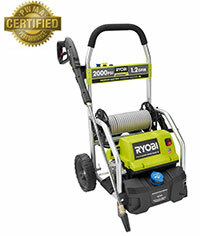 What I really like about the Ryobi 3100 PSI 2.5 GPM Honda gas pressure washer with idle down is that it comes with a three-year manufacturer's warranty against defects and damages. I also like that its Honda GCV190 OHC engine operates quietly so you do not disturb the entire neighborhood when you use it. Most of the ratings for it are in the four and five-star category. The highest reviews say that it is easy to handle even though the spray itself is powerful. The lowest ratings say that it will not stay in a locked position while using. However, this actually could be from user error rather than anything wrong with the pressure washer itself. 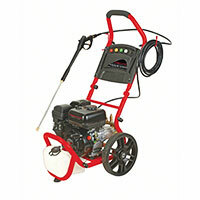 Troy Bilt 020676 2800 PSI 2.3 GPM Cold Water Gas Pressure Washer is guaranteed not to choke or sputter when you start it. You do not need to prime it, and it you never have to change the oil in its Briggs & Stratton 190cc ReadyStart manual pull start engine. 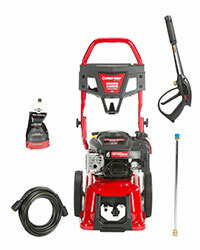 With its 25-foot rubber hose and four individual nozzle tips, this gas pressure washer from Troy Bilt costs $279. It comes with a two-year limited manufacturer's warranty. It weighs 27 pounds, making it easy to carry from place to place. Most of the reviews for this gas pressure water are in the four to five-star category. People who give it the highest ratings say that it is a solid machine and easy to put together when you first take it out of the box. They also like that it is powerful enough to use on surfaces like concrete driveways or exterior vinyl siding yet gentle enough to spray off floor mats in your car or doormats outside of your front or back door. The people who give it one and two-star ratings say that it shuts down quickly and that the hose does not hit its target with the water. However, these low reviews could come more from people not knowing how to use a pressure washer correctly or on what surfaces it can be used safely. There are more five-star ratings for the pressure washer than there are lower ratings. Briggs & Stratton 020569 POWERFlow+ 3000 PSI 5-GPM Cold Water Gas Pressure Washer CARB is built for dual use and delivers 8.75-ft lbs of torque. Its adjustable nozzles allow you to spray off small surfaces like a car floor mat or large surfaces like a concrete driveway or the side of an RV. What I like about this Briggs & Stratton power washer, which is priced at #379, is that it has a high-pressure mode that lets you dig out tough grease, dirt, and debris that has been embedded in the crevices of a driveway or the corners of a patio. It also has a soft grip on the handle so you do not strain your hand and forearm using it. It comes with a two-year warranty through the manufacturer to guard against defects and damages. It weighs 72 pounds and has a 30-inch rubber hose. The pro-style nozzle tips are also easy to twist on and take off for each job. This power washer has more than 100 five-star ratings and close to 100 four-star reviews. The people who give it rave reviews say that its spray can go as far as 30 feet and that the hose does not leak. The relatively few one and two-star ratings say that it is difficult to start and that it does not last long before it needs to be refueled. These reviews could stem from user error, however. 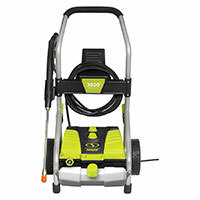 Sun Joe SPX3000 2000-PSI 1.76 GPM Cold Water Electric Pressure Washer comes with five Quick-Connect spray nozzle tips for light, medium, and heavy duty cleaning. It costs $149 and has a 20-foot hose and a 35-foot electrical cord. It also comes with a dual detergent tank for long-lasting cleaning power. 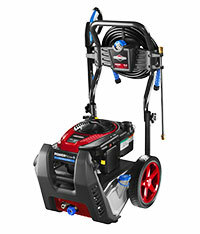 I really like the Sun Joe 2000 PSI 1.76 GPM cold water electric pressure washer because it has a powerful 14.5 amp 1800-watt motor that generates up to 2030 PSI. It maximizes the cleaning power you get out of each use. I also like that it has an automatic shutoff for when the trigger is not engaged. This feature saves electricity and also extends the life of the pump. For your peace of mind, it comes with a two-year warranty through the manufacturer that safeguards against defects and damages. The washer is CSA listed. A vast majority of the reviews for the pressure washer are in the five-star range. Most of the people who have purchased and used the pressure washer say that it is very easy to use and that it also easy to assemble. They also like that it is lightweight and relatively simple to carry around for jobs outside of the house. It is gentle enough to spray down a vinyl fence or the outside of a car without chipping off the pain. However, it can also clean the tiny nooks and crannies in a concrete driveway. 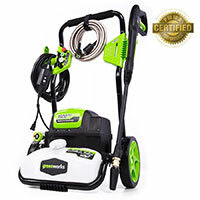 Greenworks GPW1800 1800-PSI 1.1 GPM Cold Water Electric Pressure Washer comes with a five separate nozzles that are easy to connect and designed for light, medium, and heavy duty cleaning. It is designed for heavy cleaning jobs like spraying down the side of a house or the inside of the gutters. However, it is also gentle enough to spray down car floor mats, vinyl fencing, and the outside of your house's windows. This pressure washer has an on-board soap tank that is easy to fill up and helps you get the longest use out of your pressure washer. It also has a 25-foot rubber hose, a 35-foot electrical cord, and a universal motor. Once it is fully assembled, it only weighs 25 pounds, making it easy to carry around from cleaning job to cleaning job. It has a one-year warranty that protects against damages and defects. Most of the reviews are four and five-star ratings. The people who have used and liked it say that it is easy to maneuver and simple to store. It also has a powerful spray that is still gentle enough to use on delicate surfaces like the outside of windows and the outside of a car. People who give it low one and two-star ratings say that it is hard to start and that the hose can be difficult to handle. However, these reviews could reflect a misunderstanding of how the pressure washer works. Simpson Cleaning MSH3 125 S 3200 PSI 2.5 GPM Gas Pressure Washer comes with a Honda powered motor and an OEM Technologies Axial cam pump. It has a 25-foot MorFlex hose that is abrasion and kink-resistant. It also comes with five different nozzles that are suited for different cleaning jobs inside and outside of your house. This pressure washer, which sells for $367.67, is gentle enough to spray down the outside of your vehicle as well as clean floor mats, patio furniture, and other surfaces that require a more delicate spray. However, it is also powerful enough to clean off surfaces like the outside of an RV or brick and stone masonry. I like that this pressure washer from Simpson comes with a five-year warranty on the frame and a two-year warranty on its motor. I also like that the spray gun has a lockout mechanism for safety that prevents users from being injured by an unexpected powerful blast of water. Sixty one percent of the reviews for the pressure washer give it five stars. People who love it appreciate its cleaning power and ease of use. The 13 percent of users who gave it a one-star review say it leaks water and that the Honda gas motor choke starts. This could reflect user error more than anything, however. Sun Joe SPX 3001 Pressure Joe 2030 PSI 1.76 GPM Electric Pressure Washer comes with a 14.5 amp/1800 watt motor that maintains a constant water temperature of 104 degrees Fahrenheit. It features a TSS or Total Stop System for when the trigger is not engaged that helps save energy and spares the life of the pump. This pressure washer is priced at $149. I like that the pressure washer has a sturdy handle for easy transport in and around the house. I also like that it has an onboard reel around which you can wrap its 20-foot non-kink hose. It is CSA-approved and has a two-year manufacturer's warranty on it. It also weighs a little more than 32 pounds. 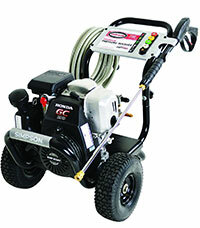 This pressure washer is designed for both heavy duty and delicate jobs. It is ideal for spraying down lawn and garden furniture or the outside of your home or car's windows. However, it is also powerful enough to spray down stone or brick masonry, concrete sidewalks and driveways, boats, and RVs. Sixty two percent of the reviews for the pressure washer are in the five-star range. People who have used it say that it gets good fuel economy and does not need a lot of gas to keep it running. The nine percent of people who give it a one-star rating say that it the power switch is difficult to turn on and off. This could reflect a misunderstanding of how to use the washer. 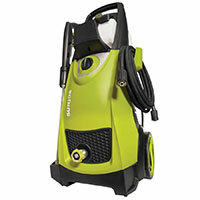 Sun Joe SPX 4000 2030-PSI 1.76 GPM Electric Pressure Washer with Pressure Select Technology sells for $159 and comes with a 14.5 amp 1800 watt engine. It has two cleaning options, LOW/1450 PSI for everyday cleaning like spraying off floor mats or your patio, and HIGH/2030 PSI for heavy duty jobs like cleaning an RV or spraying down the outside screens and windows. It comes with a 20-foot hose and an extension wand to help you clean tight spaces like the crevices of a driveway or corner of a patio. It also has GFCI protection, a garden hose adapter, and a needle clean out tool. I really like this pressure washer because it comes with a full two-year warranty. I also like that you can adjust the spray of the nozzle easily to accommodate the job that is being completed. Most of the reviews for this pressure washer are in the five-star category. Out of the 74 percent of people who gave it the highest rating, it earned praise for its easy use as well as its ability to be mounted on a wall. People also appreciate the low price in exchange for powerful washing. Six percent of users gave it a one-star rating. They say that it takes awhile for the motor to cool down and that the hose leaks. These may reflect more user error or sloppy use, however. 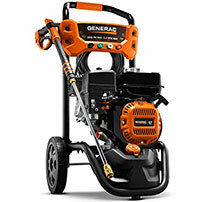 Generac 2800-PSI 2.4 GPM Gas Pressure Washer Model#6922 sells for $299 and features ergonomic designs for comfortable and long-lasting use. It has a cushion grip handle and an easy-to-pull trigger to help you avoid fatigue while using the pressure washer. It also has an integrated on-board detergent tank for easy use. This pressure washer can handle cleaning both delicate and challenging surfaces. It can be used to clean off lawn equipment, patio furniture, and even the outside of your car. You can also use it to spray down the floor mats in your car and outside of your front or back door. However, it is also powerful enough to clean an RV or a boat as well as a driveway or sidewalk. I like that this pressure washer has wheels that swivel and can make tight turns without tipping over. I also like that it comes with four easy-to-connect nozzle tips. This pressure washer earned 61 percent five-star ratings from people who have purchased and used it. They say that it starts easy and lasts a long time on a single tank of gas. They also say it is easy to assemble and store. Thirteen percent of users gave it a one-star review. The comments in these reviews say that the on and off switch is difficult to use and that the motor sputters and coughs when starting. These comments could reflect human error or failure to use the washer properly. 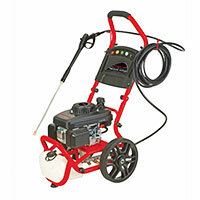 Predator 2500-PSI 2.4 GPM 4HP Gas Pressure Washer Model# 62201 is designed for heavy duty outdoor cleaning. Priced at $289.99, it has an EPA/CARB certified recoil start engine and uses 86+ high-octane unleaded gas as its source of fuel. Its motor also a low oil shutoff feature, making it economical and safe to use. The pressure washer weighs around 70 pounds, making it somewhat awkward and heavy to carry from job to job. However, it comes with its own roll cart as well as a coil around which to wrap the 25-foot rubber hose. The wheels on the pressure washer are 12 inches in diameter, making them compact enough for easy storage. What I like about this pressure washer is that it comes with five quick-connect nozzle tips, all designed for different jobs like spraying down a driveway or targeting smaller surfaces like a doormat or car floor mat. I also like that its detergent and chemical injector is located right on the hose. This pressure washer from Predator has garnered mostly five-star reviews from people who have purchased and used it. The highest reviews say that it is easy to assemble and simple to use. Even the smallest amount of gasoline in the engine gives hours of power washing. Some of the lower reviews say that the engine sounds odd when it starts or that it sputters. However, these reviews could be attributed to user error or poor maintenance of the washer. 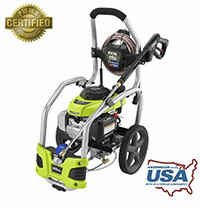 Predator 3100-PSI 2.8 GPM 6.5 HP Gas Pressure Washer Model# 6220 is EPA III certified and has a recoil start motor uses 87+ high-octane unleaded gas for its fuel source. Priced at $364.99, it comes with a 25-foot rubber hose and weighs in at 77 pounds. It measures a little more than 36 inches high and 21 inches long with 12 inch tires, making it compact for easy storage in your shed, garage, or elsewhere. This pressure washer from Predator is designed for heavy duty outdoor cleaning jobs and can be used to wash down the side of a house or spray off a driveway. However, it comes with five easy to connect nozzles that also allow it to gently spray down smaller surfaces like a patio or mats used outside your door or inside the car. I really like that this pressure washer comes with a commercial-grade axial pump that is designed for tough jobs like rinsing out a garage floor or spraying down brick masonry. I also like that its chemical/detergent injector is located on the pump. The pressure washer gets mainly five-star reviews on Harbor Freight's website. The reviews say it is fast to assemble and has a powerful spray for fast cleaning. The lower one and two-star reviews say that the hose handle is prone to leaking or that the hose split. This could be more from misuse or user error, however. 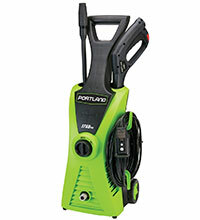 Portland 1750-PSI 1.3 GPM Electric Pressure Washer Model #63254 is built for heavy duty jobs like cleaning walls, yard equipment, and vehicles. It comes with a 20-foot long rubber hose and has wheels that are four inches in diameter. Its compact size combined with its weight of just 21 pounds make it easy to carry from job to job in and outside of the house. I really like that this pressure washer has a long electrical cord that is 35 inches in length. I also like that it has an automatic stop for its motor when the trigger is released. This feature makes it economical to use and spares the longevity of the motor. It comes with a number of accessories like a spray gun, soap dispenser, and extension nozzle for fast and easy cleaning. Priced at $99.99, this pressure washer can be the ideal pick for anyone who wants powerful high-pressure washing without spending a lot of money. It has mainly four and five-star reviews on Harbor Freight's website. The four and five-star reviews from customers say that it is ideal for cleaning surfaces like vinyl decks and fencing. They also say that it delivers on its promise to give a powerful spray and long-lasting performance. The lower one and two-star ratings, which are relatively few compared to the higher ratings, say that the nozzle is difficult to adjust and that the hose leaks. These lower ratings could be from user error, however. 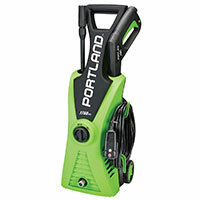 Portland 1750 PSI 1.3 GPM Electric Pressure Washer Model #63255 is priced at $99.99 and comes with accessories like a spray gun, extension nozzle, soap dispenser, and a 20-foot high-pressure rubber hose. It weighs 21 pounds and has wheels that are four inches in diameter, making it lightweight to carry and simple to store. I like that this pressure washer from Portland comes with its sturdy handle and has compartments on its sides where you can store the nozzle, spray gun, and other components. I also like that it can stand upright on its own without it having to be contained within a rolling cage. This pressure washer may be compact and somewhat unassuming in appearance. However, it delivers a powerful spray, making it perfect to use on surfaces like a garage floor or concrete driveway. It can also be used to spray down vehicles like your car, an RV, and a fishing boat. Most of the reviews for this pressure washer are generally favorable with most customers giving it a four or five-star rating. The people who give it favorable ratings say that it is great to use for surfaces like wooden fencing that are being primed for painting. They also appreciate its economical value. However, it does have a few one and two-star ratings in which people say that the nozzle is not long enough or the spray does not reach as far as they would prefer. These reviews reflect individual preferences and do not reflect the actual specifications of the washer. After reading a ton of reviews to create this article, I was a bit hesitant to purchase a machine. However after getting my pressure washer, I quickly realized that the 1 & 2 star ratings at least on my machine and others like it are from people who DIDN'T READ THE INSTRUCTIONS! Yes about 95% of the problems I read about would have been avoided by actually reading the manual and quick start guide. I ran into some of the issues these people talked about, but knew what to do thanks to the information you'll find right here. Quick Tips That Will Prevent You From Breaking Your New Pressure Washer! 1. Make sure you have oil and the correct amount before you start your pressure washer every single time! Yes I read reviews from people who have actually broken their brand new machine then complained that it's a piece of crap. 2.Do not run the pressure washer without connecting your water supply , making sure there are no kinks in your supply hose, and that your supply is turned on all the way. A lot of negative reviews were from people who blew out their high pressure seals because they ran their pressure washer without having their engine supplied with water. There's a popular YouTube Tool reviewer who even ran this pressure washer without water, just never do it. 3. After you just used your pressure washer the machine won't start if you put it back into choke mode, simply slide it back to run and then pull start it. This happened to me, and a bunch of reviewers who ended up returning the machine even though in the intructions it specifically states this procedure. 4. Buy pump protector and use it to extend the life of your pressure washer pump. This will clean the pump, lubricate the o-rinngs, and protect it from freezing. Amazon sells the Briggs & Stratton Pump Saver which I'm going to buy next, for the time being I bought the Power Care Pump Protector from Home Depot but it has worse reviews. I bought the Ryobi RY802800 after doing all this research and considering what I need it for. Originally I was going to purchase the Sun Joe SPX3000 electric pressure washer from Amazon, until my washing machine sprayed water out of the drain during the spin cycle.This happend once before, a clogged drain so I tried to snake it which worked last time. This time I was out of luck, so I did some research and bought the famous Instant Power Main Line Cleaner from Home Depot and it helped to clear the drain a bit, but a medium load in the washer still caused chaos. So my research uncovered that the best way to clean your homes sewer line is to use a gas pressure washer with a sewer jetter kit like this 100 foot kit I just ordered. Sadly electric pressure washers don't have enough power to perform this task, and I'm SO GLAD that my drain clogged now before I bought an electric unit, because I would be pretty bummed out if it happened 1 day after the return period expires and I'd be forced to hire a plumber for $500.